Outdoors NW, the Northwest's leading outdoors magazine since 1988, debuts a new bicycling publication next March. "Seattle and Portland are known as the two greatest bicycling cities in the country and our readers want as much information on bicycling as possible," says publisher Carolyn Price. "The timing of NW Cyclist is perfect." With the city of Seattle committing $350 million for improved bike/ped trails and lanes and Portland having the highest number of bicycle commuters of any American city, the launch of NW Cyclist comes at a time when bicycling is at an all-time high, says Price. NW Cyclist will feature some of the best road and mountain biking areas in the Northwest as well as bicycle commuting tips, favorite Northwest rides and tours, gear and accessories, rail to trails and event previews. 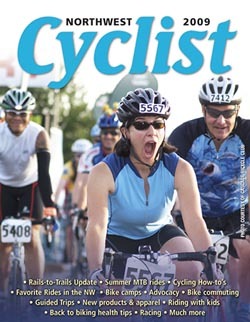 The annual magazine will be edited by seasoned bicycling writers Amy Poffenbarger and Jennifer Donahue, both of Seattle. NW Cyclist will debut at the 21st annual Seattle International Bicycle Expo in March and will be inserted as a stand-alone magazine into all 40,000 copies of Outdoors NW's March/April edition. Additional copies will be available at top bicycling retailers, bicycling events and direct mailed to NW bicycle club members. "With our long history of being a bicycle-friendly region, and so many new people getting into biking in the area, NW Cyclist will become a very popular magazine," Price predicts. "NW Cyclist also offers advertisers a great opportunity to reach a targeted niche market." To receive advertising information, please contact Carolyn Price or Greg Price at (206) 418-0747 or advertising@OutdoorsNW.com. The deadline for space reservations is Feb. 13, 2009.